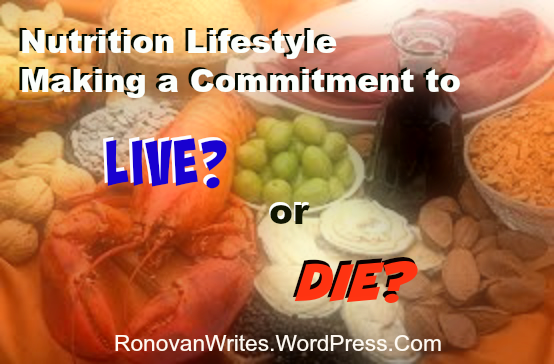 Making a Commitment to a Nutrition Lifestyle. Time for a bit of motivating on this Monday. More for myself than anyone else. I have decided to try out the diet known as the Paleo Diet for my Fibromyalgia. I’ll give more information about Paleo in another article. Now, at this time I want to stress a point. I am not, repeat not, going on a diet. Yes, I need to lose weight, but my goal in life is to be healthy on the inside. I have my reasons. Some obvious and some I like to keep to myself. Wow that was a total off the subject ramble. But it’s my blog and I’ll ramble if I want to. Taking a deep breath before I go off on song lyrics now. I’m not dieting. What I am going to refer to this moving forward and I’ll be possibly doing something future with my journey in a book form if things go well is something I call a Nutrition Lifestyle. Diet is word that was never meant to represent a losing weight regimen. Your diet is what you eat. I believe it’s time we took that back. I also think it’s time we took back our foods. Processed foods are killing us. With Paleo, I’m changing the title of that to Clean Food Nutrition, this means as natural food as possible, not being Nazi about it, but doing the best I can with the finances I have. Have you ever looked at ground beef in the stores? For those outside of the USA ground beef is the kind of meat you would make a hamburger from or meatballs. Due to allergies in my home labels are studied thoroughly. You will find on some ground beef packaging that beef flavoring has been added. The first time I read this I had no clue. After it was shown to the butcher he was shocked as well. After all, unless you are buying a roast and then having the butcher grind it up for you, which you can do, the ground beef comes to the stores prepackaged. Many chickens and the various parts in the butcher area show having broth added. Before Vegetarians and Vegans say just don’t eat meat, you then venture into the vegetable areas in the produce and you will unfortunately discover some produce are treated with a preservative in the fields without the store even knowing it. This happens with nuts as well. The bad part? The preservative is a natural product so it can be called all natural or organic. Soy is organic. Soy is a huge problem these days as people are now developing allergies to it being in just about every food we eat. For me, it’s not so bad. I can eat just about anything, technically, but I won’t. So we’ll see what happens, and I’ll keep everyone updated. I’m also throwing some Yoga into the mix. I’ve tried some recently but it completely flared my Fibromyalgia so out of control that I’ve been, truthfully, scared to try it again. But what’s it gonna do, make me hurt more than a flare? One last reason I have to do this is because medications I am on cause weight gain. I worked very hard to lose a lot of weight and then was put on the meds. Not all the weight is back, thank goodness, but I also can’t be put on Blood Pressure medicine because basically it drops my pressure too low and I have a chance of fainting and hitting my head, and having another concussion, that isn’t acceptable. I’ve fallen several times since that day two years ago and lost memory progress I had gained. No more concussions for me. So for me, it’s life or death. And I mean that in many ways.